My little machine was made in 1956 at the Singer Factory in Kilbowie, Scotland near Glasgow. This area is also known as Clydebank. Interesting history. Here's a little video clip of the production line in this plant, not of the 222K but other machines. Click on the quicktime clip to see it. Now the reason why I really wanted the 222K model as opposed to the 221K model is that this one has a darning feature. Remember when I first discovered them? This means that the feed dogs will lower and that it can be used for free-motion embroidery. It also has the nice handy little feature of being a free-arm machine with the removal of one little screw. Cool, huh? Rachel insisted, once again, to be part of the photo shoot. Here she's demonstrating how easy it is to lower the foot to start sewing. Also, if you'll notice closely at the motor that it is an official Singer 110 volt motor. That's Graham's specialty - he switches out the 220 volt European motors in favor of the 110 volt North American motors. 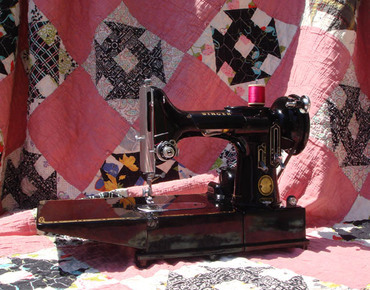 Apparently there's many American quilters here who love to buy his machines. :-) And the little black case that it goes in. The entire machine is pretty lightweight .. about 1-2 lbs heavier than the 221K model, but still manageable. Graham was such a pleasant man and a great person to buy a machine from. It only took a day or two for the machine to ship from London to California. (I'm the one who's been holding back on photographing it.) He's also the best guru out there for any information you need about the Singer Featherweights. Oh my goodness, I almost forgot to talk about the lovely quilt that is in the photographs. My grandmother made that for me when I was a young girl and it's seen a lot of use. It's starting to have a few rips here and there that I need to mend but I don't want to just put it away. I get more pleasure out of using it on a daily basis as my lap quilt, than I ever would if it were stored out of sight. The pattern is a churn dash, directions for it are here.